Christopher Owens reviews a book about a 1991 murder in the US. Once viewed, it's difficult to remove the imagery from the memory. Grainy, wobbly, silent and washed out, you still get the whole story: a young girl approaches the counter to pay for a bottle of juice (which is in her backpack). The store clerk grabs the girl (thinking she has stolen something else), who then punches the clerk in the face, sets the juice down and walks away. As she walks away, the clerk fires a gun and the girl drops out of sight. All in the space of 25 seconds, an innocuous occurrence turns into murder. This video camera footage captures an incident that, on 16th March 1991, ended with the murder of 15 year old Latasha Harlins at the hands of a 48 year old Korean immigrant. The subsequent non-conviction set off a chain of events that, coupled with the beating of Rodney King, led to the 1992 LA riots. Their lasting legacy of bitterness, racism and lack of judicial punishment mirror the recent riots in the UK: well publicised but lacking understanding or context. So it's to Brenda Stevenson's credit that she takes this incident, examines the history of the three key participants (Latasha Harlins - African American - victim, Soon Ja Du - Korean- killer, Joyce Karlin - Jewish - judge) the result and how these personal histories may have played into the events. Looking at the history of black, Korean and Jewish Americans from the 1800's right up to the present day allows a certain amount of scene setting from Stevenson, showing how each community suffered from institutional racism (some certainly more than others), but persevered and proceeded to build communities that would look out and support each other, all while feeling the pressure to chase after the American dream and become the perfect model for immigrants. After that back story, we get the immediate tales of the Harlins, Du and Karlin families. Predictably, the most tragic story is that of the Harlins. A hard working family struggling to keep their children out of trouble after the murder of Latasha's mother and the disappearance of an abusive step-father. It makes the murder (over a bottle of $1.79 orange juice) all the more dismal. For me, the most illuminating segments involved Soon Ja Du and the history of Korean immigrants into America. A bizarre woman who pretended to be unconscious while in hospital and showed no remorse whatsoever for the killing, Stevenson suggests that the answer to this attitude lies in her Korean background. Coming from a more middle class, she would have been expected to have been an average housewife. Moving to America, however, meant that she had to work just as hard as her husband, creating some kind of resentment over this. And this wasn't confined to the Du's. There were regular complaints from the black community about Korean shopkeepers setting up in areas with a black majority, not employing locals and being abrasive to the local clientele. Korean businessmen pointed to the amount of robberies, attacks and (in some cases) murders that took place in their stores. Put together in the Reaganite/George Bush era of prosperity, success and war, it was a disaster that maybe could not have been averted, even if Judge Karlin had not ignored the jury and sentenced Mrs Du to community service instead. 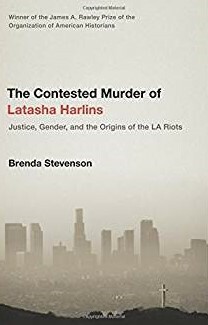 The Contested Murder … has one question at it's heart: what role (if any) did gender and race play in the case? After reading, it's difficult to avoid the conclusion that racial tensions inadvertently played a role in the murder, and that both gender and race led to Mrs. Du not serving any time for murder. It's possible that the image of the immigrant, middle aged shopkeeper being attacked by the young black female (whom, Mrs. Du remarked, looked like a gang member) was too powerful for Judge Karlin to ignore. Systematic racism? Gender inequality? Other factors? It's difficult to say, but Stevenson has made a compelling case for injustice on the part of the Harlins family. As a writer, Stevenson has managed to write a succinct examination of the case while condensing vast chunks of recent American history into the tale to serve as context. At no point does it feel strenuous or out of place, rather it flows into the narrative in such a way that you feel like you're about to witness a traffic accident in slow motion and there's nothing you can do to stop it. Maybe the lack of recent statements from the Du family or Judge Karlin hinder but it's hardly likely that they've re-evaluated their stances since the case, so I'm probably being unfair. A deeply disturbing case finally gets the critical book it deserves. Read it and be aware that it could happen to you. That is a great critique that in my mind had ne considering this book as sort of flipside 'Bone Fire of the Poverties'-an alternative take on Tom Wolfe's classic tale. That's actually a brilliant way of looking at it, Christy. Never thought of it, but that makes perfect sense.